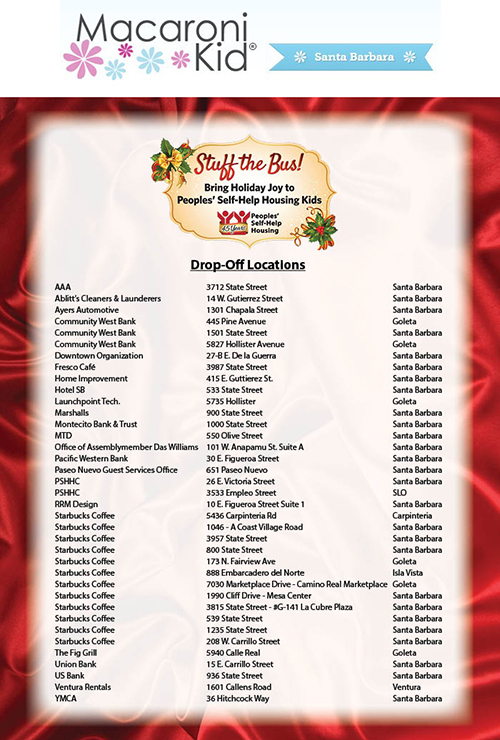 Peoples’ Self-Help Housing (PSHH) is inviting the community to help make this a magical season for hundreds of low-income children by donating new, unwrapped gifts at one of many drop-off locations at local businesses for the Seventh Annual Stuff the Bus gift drive! On Wednesday, Dec. 16, 2015, Santa Claus will cruise down State Street in a decorated MTD bus for the Stuff the Bus Parade and will stop to pick up boxes of collected gifts from local retailers for children ages 1-11 living at PSHH’s affordable housing properties from Carpinteria to Goleta. In addition to new, unwrapped toys, PSHH is requesting gift cards for clothing, shoes, and books for resident pre-teens and teens, ages 12 to 17. The Stuff the Bus Parade begins at 10 a.m. on Dec. 16 at Community West Bank, located at State and Micheltorena Streets, where Mr. and Mrs. Claus will be available for photos before boarding the bus with elected officials, committee members and invited guests. Escorted by the Santa Barbara City Police Department’s ’57 Chevy, the convoy will make five short stops along the route to pick up toy receptacle boxes before arriving at PSHH’s Ladera Apartments, 322 Ladera Street. There, awaiting volunteers will sorted and wrap the gifts. For more information, call 699-7220 or visit www.pshhc.org. To donate by smartphone, text “BUS” to 51400.